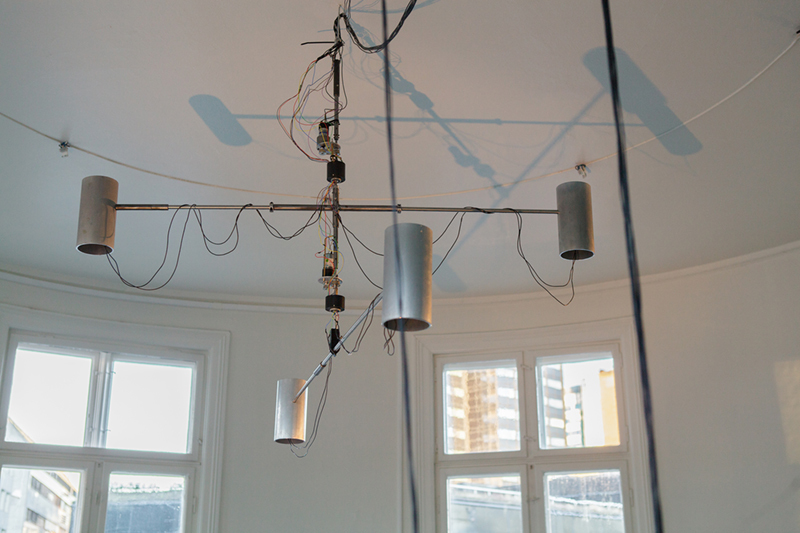 Two horizontal aluminium rods, each 140 centimetres wide, rotate from a central axis. The speed and direction of the arms will slowly change according to a choreographed pattern that lasts for 28 minutes, the intensity alternating with the sound. The soundscape, corresponding with the movement, is composed by Signe Lidén. 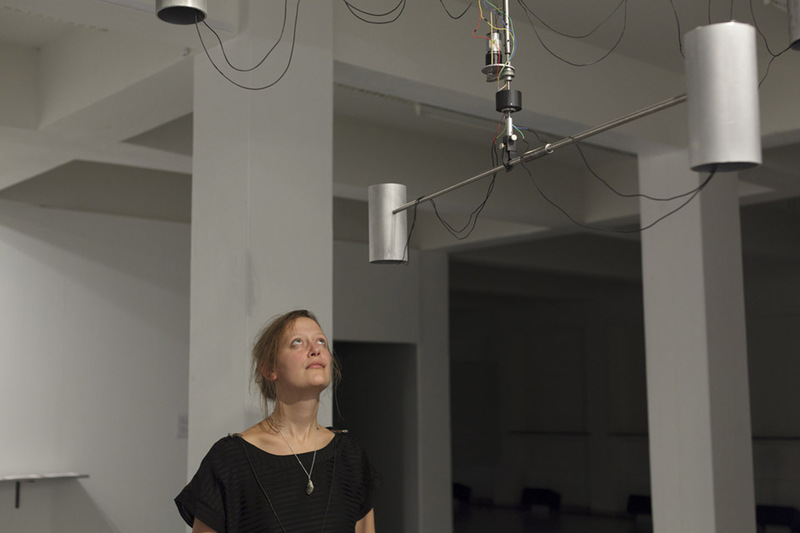 Depending on how a viewer is standing under the sculpture, the layers of sound will pan slowly above her head, and change accordingly as the speed and distance alter its effect. If the spectator stands just below the loudspeaker, the sound is clear and distinct. Further away from the loudspeaker the sound turns into more ambient textures that blends with the other sounds present in the gallery, forming a landscape of abstract sound. 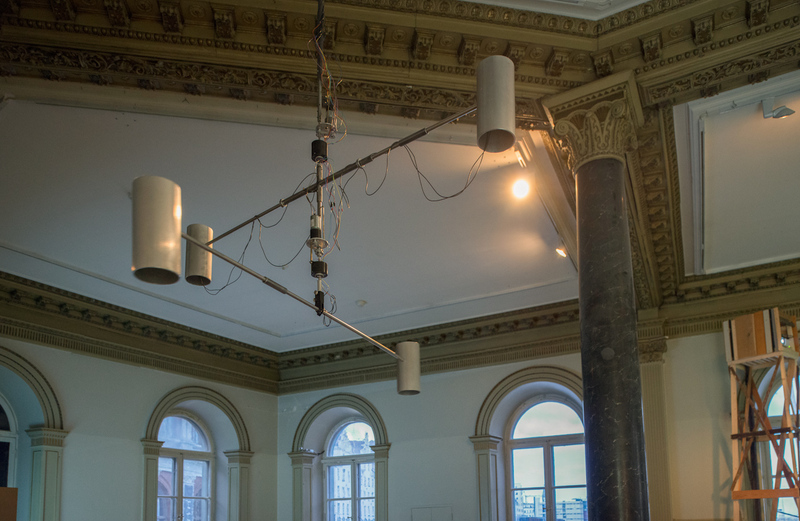 There are four separate sound channels, each assigned to one of the four loudspeakers, emerging as distinct layers from the aluminium tubes that shape the direction of the sound waves. The sound is irregular yet mechanically resonating and machine-like, with frictionous layers of distinct, abstract sound that evolve with rich textures at various frequencies. The raw material used in the composition was recorded by Lidén who used contact microphones and a stethoscope to listen to and capture various parts of the machinery constituting the Proton Synchrotron at CERN.